ATA wishes to recognize the following companies for their contribution to the ATA Annual Conference and their invaluable support of the translation and interpreting fields. Each company provided its own description. SDL Language Solutions offers innovative translation software, such as industry-renowned SDL Trados Studio, to the entire translation supply chain, including freelance translators, language service providers, corporate language departments, and academic institutions. SDL Language Solutions is dedicated to supporting and developing translation productivity software and services for the translation industry. 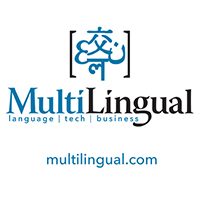 MultiLingual magazine and multilingual.com are the world’s go-to source of information about the language industry. For over 20 years, global business professionals have relied on MultiLingual to stay up-to-date on tools, technologies, standards, and methods impacting the creation of multilingual content.